The JobRoller Job Board Premium WordPress theme will instantly turn your WordPress blog into a full-featured professional job listing Web site, so you can start offering free job listings as well as selling premium listings for job offers in no time. 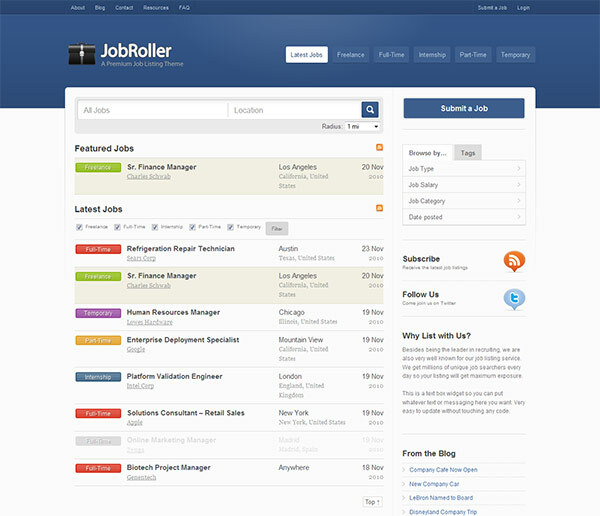 JobRoller is a popular job board theme for WordPress that was built for ease-of-use and tight integration with WordPress, so you’ll be online and selling job listing space within minutes. Job listings are kept totally separate from your blog posts. You get a dedicated job listing management section to see exactly what’s going on. Makes it easier to manage and keep track of your listings. JobRoller includes powerful options that can change how your site runs without requiring a developer. It’s all GUI-based with detailed help on each option so you know exactly what you’re doing. Keep track of all your job listing sales from within JobRoller. Every time a PayPal transaction takes place, it securely sends it back into the JobRoller database so you don’t have to login to PayPal in order to check your sales. Company image logos uploaded with each job listing are automatically re-sized into three different sizes. All images are accessible from within the WordPress media library and are visible on the job listing edit screen which makes management a breeze. You can choose from five different color schemes with the option to remove the right sidebar. You can also upload your own logo which makes it easy to brand your site. The theme uses the de-facto WordPress GNU gettext localization framework. This means it’s easy to drop in a new language file without touching any code. Free language packs are also available for some languages. Each job listing includes a built-in “Apply for this Job” form so applicants can instantly upload their cover letter & resume. Their application gets routed directly to the job poster via email. JobRoller includes the latest technologies with features like AJAX field auto-complete and jQuery Lazy Load which helps your site load faster and saves you precious bandwidth costs. Your customers get their own personalized dashboard where they can view and re-list their jobs once they expire. It also keeps track of when each job was listed for archiving purposes. Give your customers an option to have their job listing “Featured”. It will be prominently shown at the top of the home page with a highlighted background. You set the price for this option which is sure to bring in extra bucks. The three step job submission wizard gives your site the professional treatment it deserves. Step two includes an order summary before taking customers to a payment page. With built-in payment gateway support, you can start collecting payments for new job listings almost immediately. The theme currently supports PayPal (Standard and IPN), but will eventually include several other gateways. Get instantly notified when a new job listing has been submitted. The custom emails include things like new ad approved sent to your customers once their ad is approved. It also puts your site on auto-pilot and helps drive additional ad renewals. The JobRoller theme runs right out of the box and requires no other plugins to function. Most of the features you would typically use a plugin for are directly built into JobRoller. Of course you can always use other plugins.